As batteries continue to work harder in modern systems, it is vital that technicians know the basics of battery management and replacement. Roadcrew, part of Volvo Group UK, offers some helpful guidance. 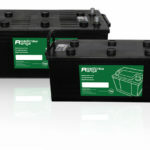 the battery is a vital component of the truck. Given that commercial vehicles typically operate numerous systems, from tail-lifts to televisions, it is imperative that the battery not only has high performance, but is also reliable. When it comes to a ‘failure to start’, the most common thing to look for is a discharged battery, rather than a fault with the product. A battery is only a storage device and if it is not supplied with enough energy, or the energy is used without being fully replenished, then it will not perform its primary function. Before any replacement of a ‘failed’ battery is considered, it is therefore vital that technicians perform the correct testing. If a discharged battery is incorrectly replaced, the new replacement battery may also soon fail to start – this is where a quality battery testing device is crucial. It is worth noting that if a battery is faulty, it is always best practice to replace the pair of batteries, rather than the individual problem battery. If this is not done, the new battery will often be overworked by the older, deteriorated battery, and will most likely fail more quickly. In addition, batteries that replace an old battery should always be the same or higher cold cranking amps (CCA) or ampere hour (Ah) specification – a lower specification would be unable to perform the vehicle’s required tasks, leading to failure. Fortunately, says Roadcrew, the company’s new range of branded batteries is supplied to OE specifications, designed to withstand the most vigorous vibrations and is maintenance free. Great care should also be taken when it comes to disconnecting or connecting terminals to the battery to avoid shorting out with the vehicle or on the battery housing, whilst wearing metal watch straps or rings should always be avoided when undertaking work. Roadcrew has a full range of insulated tools available that it recommends using to prevent any shorting. It is beneficial to recharge a battery every time a vehicle is in for servicing or repairs, and it is recommended that any battery on a commercial vehicle application should be recharged by an external charger at least once every two months. A final note to mention is that all batteries should be scrapped in accordance with waste regulations given the nature of the product and its environmentally toxic lead and acid content.